Missionaries Obed and Cara Zuleta have been encouraging a local Guatemalan church to reach out in missions. 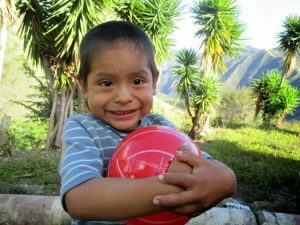 Cara writes, “They got excited and put together a few Bible classes for kids, and then Obed accompanied them to a small, poor community called Panquix. As we hoped, this church realized they could make a difference in the lives of others, and returned a second time for a 3-day Vacation Bible School. Being in a distant community, sharing with its people, got into their hearts. So this year they organized an activity to share the Gospel and give toys to all the kids. Salvation bracelets were the base of the message. Each child made a bracelet, participated in some games, and then heard the message of salvation using their new bracelet. So many mothers came to the event that the pastor’s wife took them to another room and shared the gospel with them in a more grown-up way.